Alien Shooter is an action shooter game with epic story and swarms of alien enemies. Download Alien Shooter free games now! If you like this free game, try Alien Shooter 2. 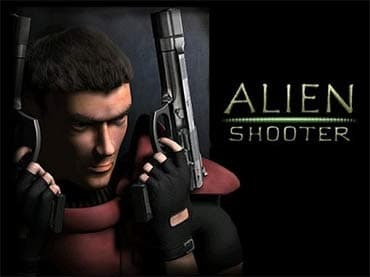 Alien Shooter is an action shooting game developed by a Russian studio: sigma team which produces wonderful games such as zombie shooter, zombie shooter 2, alien hallway and a bunch of other amazing pc games. This game is loaded with thrill and action you can hear your heart pounding with every step you take. The story brings you to an underground laboratory where several military assault mission had failed and their contact with them was lost. You were a mercenary sent to investigate the issue. Upon infiltration, the military complex was under alien invasion and bloodthirsty creatures fill the military base. It turns out that the teleportation devices from a top-secret experiment have been opened and aliens are pouring out from the teleportation devices. As bad as it sounds, you lost the connection with the outside world too. You are left to fight this alien war alone before the reinforcement comes. As you escape deeper into the building, towards the endless darkness you will discover more aliens which are much more powerful. Fight for your survival in this scary alien pursuit. Your mission is simple: clear the base at all costs with your character un-scarred. With the hoards of monstrous creatures charging at you relentlessly, it is pretty clear that survival is your main objective. To clear the individual level, players need to gain access to all area of the level, activating power generators, destroying walls and disabling force fields. The mission can be really intimidating as the teleportation of the aliens from their galaxy do not stop until the teleporter is deactivated. Alien creatures can swamp you in any direction in the bloodthirsty creature filled room. In the later level, you will have to destroy teleportation devices which spawns the aliens indefinitely. These devices can only be destroyed by special explosives that are scattered throughout the level. Advance through 9 exciting levels in this ultimate survival game that will keep your adrenaline pumping. Unlike Zombie Shooter, you begin this RPG game by choosing your hero. You can choose between male (stronger with more health) or a female (faster and more accuracy) character. Alien Shooter, has an isometric topdown shooter view of a ¾ perspective. There are 4 important stats that you should know. 1.Strength 2.Accuracy 3.Health and 4.Speed. These attributes can be enhanced at the later stage and it will greatly help you in your fight against the gush of aliens. In the early stage you are only equipped with a basic pistol with unlimited bullets as well as flashlights and 20 bucks. You can buy a variety of weapons with the money you earned. By having a good aim at the oncoming bloodthirsty creatures and exploring the level, you will be able to earn money for better weapon upgrades. Killed aliens will drop pickups, consisting of money, health, ammo and other helpful items. Between levels players can buy stronger weapons in a shop. Permanents stats (bio-chips) are also available in the shop to improve our 4 stats. There are also temporary stats that can be purchased include lives, body armour and attack. You will be impressed with the spectrum of weapons that is available in the shop. Sigma team has done a great job providing wonderful 2D graphics that brings the game back to the 90s. Alien shooter is filled with surreal weapon effects and alien bursting effects such as exploding bellies, dripping blood corpse and flesh of alien spreaded around the game area. Every level is an interactive environment with explosive and destructible objects that can be triggered all over the map. You could even shift objects to impede the advancement of the alien creatures. In conclusion, if you are a fan of heart throbbing action games, you should really try out Alien Shooter. The developer has done a decent job in making this a thrilling game. With that said, if Alien shooter can allow co-operation or multiplayer plays, the game will be perfect. Nonetheless, this free game is still worth the download for all thrill seekers out there. If you have questions about Alien Shooter game, please contact us using this form.